Yesterday the publisher services company Lulu.com announced that John Edgar Wideman, two-time winner of the Faulkner Award for fiction, would be publishing his new collection of short stories, Briefs, Stories for the Palm of the Mind, in conjunction with Lulu’s new VIP program. Wideman has been published for years by Houghton Mifflin, according to the report in Publisher’s Weekly. This was notable, although Wideman may just be the first of many as self-publishing gradually loses its stigma and is seen as simply another path to publication, and for many people, a superior one to the traditional publishing route. Wideman decided against a traditional publishing contract — and royalty advance — for Briefs because he wanted more control over the publishing process and to develop a more direct connection with his readers. He also wanted to experiment at a time when the publishing industry is undergoing more revolution than evolution. . . . I like the idea of being in charge. I have more control over what happens to my book. And I have more control over whom I reach. I’ve often heard other self-publishers voice the exact same sentiment, although few had a royalty to turn down. But there are also echoes in Wideman’s statement of the move to what you might call author self-empowerment. When publishers rely on authors for marketing plans, platform building, and finding their own community of readers, they inadvertently also pass a great deal of power over to the author at the same time. Self-publishers have traditionally grasped for this power directly. Before the internet, self-publishers lived by direct mail, and the direct selling that happens on the internet today owes a great deal to what direct marketers have learned over the last 50 years in other media. But the growth of self-publishing as an accepted path to publication, aided by authors like John Edgar Wideman, is not what this article is about. No, this article is about you. Wideman found compelling reasons to self-publish his book, based on an informed and pretty astute reckoning of where publishing is at the moment. But, like anyone connected to book publishing, I often hear the exact opposite from people who buttonhole me and start telling me about the book they have “in their desk drawer” or “packed up in the attic” or “in a big box under my bed.” These stories are amazingly common. A woman dreamed of writing a book, spent months working on it, but never got any further. Or a man, getting up early for years, completes a manuscript but just prints a few copies to give to friends. Why? Because they have found many reasons to not self-publish. Look, most authors are never going to get a contract offer from a big—or small—publishing house. The demand for publishing far outstrips the supply of big-publishing company openings for books. That’s what’s caused the meteoric rise of self-publishing, once digital printing and print on demand distribution removed the monetary risk of getting into print. So what obstacles are left? Why haven’t these writers become authors, fulfilled their dream of publication, and found their readership? You don’t want people to look to you as an authority—Authors acquire a definite authority within the area they write about. This is particularly true of non fiction authors. Even though you know quite enough to write a book on the subject, does something about being looked to as an authority make you nervous? You’re afraid of speaking in public—It’s common for authors to be asked to speak in public, and to pursue public speaking as a way to market their book. Common knowledge tells us that the number one fear in Americans is the fear of public speaking. Perhaps this is really the fear of appearing a fool in public. Is that what’s stopping you? You don’t need another income stream—Novelists would like to make money from their books, but would write them anyway. Nonfiction authors often write in order to make money, to capitalize on a business opportunity or leverage their experience to improve their clientele or their hourly rate. The independently-wealthy and people satisfied with their current income might see self-publishing as a waste of time. You have nothing unique to say in your field—Maybe you’ve spent a career as a primary school teacher, following curriculum. Perhaps you’ve been a cubicle slave for years, and the creative juices have been beaten out of you. I’d say it’s more likely you’ve simply forgotten how unique your own perspective on life, your business, or your hobby really is. You’d rather not contribute to publications in your niche—Once you start publishing you naturally start marketing, and writers use writing as a way to get the word out. But maybe you are embarrassed by the chance you might seem to some a “know it all” if you start getting articles published in relevant trade magazines and websites. That could slow you down. You prefer to wait a few years and see if you get offered a contract—There’s a certain kind of writer who is happy to write, and never get published if they can’t get that contract from Knopf, or Random House, or whoever. They accept the wisdom of the agents and editors they submit to (literally) over the years, and feel it’s better that their work stay unknown, since it’s unworthy of their gods. That’s a tough one. You hate the idea of autographing books for buyers—Having fans, people who will show up at bookstores to hear you talk, stand in line to get your autograph, may be disconcerting. People in our culture often feel unworthy of attention, as if others are deserving, but I am not. Maybe this shame was drilled into us when young, it certainly is long-lasting. I fully expect to see more authors like John Edgar Wideman turning to self-publishing out of pure self-interest. But many other writers can do the same thing. The tools of Lulu and other publishing services companies are there for us to use. Many involve little or no expense. Writers who publish a book themselves, if they are realistic in their expectations are usually energized by the experience. Since print on demand means you’ll never get left with a garage full of unsold books, the risks have become almost completely psychological. My message is this: Now is the time. It has never been easeir, faster, or less expensive to get into print. With the tools of the internet and social media, the marketing landscape has never been so level. Go drag that box out from under the bed. Climb up into the attic and pull that manuscript down. Fulfill what you started, or start what you’ve dremed of. You won’t regret it. Takeaway: The obstacles to publishing are, increasingly, within us. Our opportunities to self-publish have never been better, and the stigma of self-publishing may fade rapidly. The time to act is now. I really enjoyed this post. I’m not a published writer yet but I have recently written many stories that I hope to get published one day. I have been doing a lot of research and soul searching these last few months and I am starting to believe that perhaps self publishing would be a good fit for me. I always held to the belief that you wouldn’t be successful as an author unless you had a publishing contract. Now I’m starting to have hope that maybe I can do this myself. Thank you truly for the wonderful and entertaining post. Ren, thank you for a really interesting comment. I’ve often been told that there’s a remarkable similiarity between the indie musicians who have been empowered by selling on line and the self-publishing authors who seek to do the same. And with the iBookstore equivalent to iTunes, it will be fascinating to watch as this movement continues to develop. You’ll recognize right away what I mean by “winning” because you’ve already been there. Thanks for visiting and adding to the conversation. I’ve tried music publishing and book publishing – self-produced both times, and I found some very good points here in your article. I think that while there are MANY similarities to both industries in terms of the mass quantity of interested parties versus the amount of people who actually find success, for example. But also, I found personally that by comparing my sense of accomplishments – not measured in terms of units sold or monies accrued, but in a very substantial sense of personal achievement – I found that there is a real decisive issue made when a person proceeds down either path. More importantly, it reveals itself when and if they continue. Making a CD was revelatory. I learned as much about the business and the process of sound design and music production as I did about my own priorities and desire to strive towards success in what is arguably one of the most terrifying career choices out there (up with perhaps modeling and acting). In the end, holding the finished product in my hands, there was the emboldening satisfaction of seeing my vision take physical form, and that alone was…well, you understand it. It’s breathtaking. But I also realized that, in the end, the traumas of giving birth to that sort of thing was a series of anguished discomforts I was not willing to suffer again. Whether I was “good enough” or not was not even a concern – like you said about novels, there are a lot of people who can’t write that consistently produce – but in face of that blistering awareness of what I would in the end be willing to put on the line…. well, for a thousand soul shattering reasons, I just wasn’t willing to continue down that road. Oddly, writing novels hasn’t had the same effect on me. Each word I see in print is a point of pride and satisfaction. Would I want to make a living at it? Sure! Would I love to have a top selling novel? Who wouldn’t? But, as it turns out, it’s not just about that. I simply love telling stories, and until (or unless) I’m one day signed by a pubisher, I’m more than happy to consign myself to the practice of completing books and self-publishing them. In the end, as you said, now is the time. Thank you for your articles. In this gloriously spacious sea of information, yours has been a welcome find. Zoe, LoL, love that “bite me” line, that’s good. And you are making a valuable contribution here, that’s not hogging. What a waste. I have no doubt some of these people are excellent writers, and no one will ever get to read them, they will never have the audience they deserve. Sad. Thanks for all you do, Zoe. Joel, I think that’s what bugs me the most too. I hadn’t really sat and thought about it until you said that, but it is. I’ve practically beat my head against the wall trying to figure out *why* I get so irritated about all this, and that’s it. It’s the bullying part. It’s looking at all the untapped potential out there that will never be tapped because of people giving in to social pressure and sitting in their corner like good obedient writers. Sure, some people aren’t good writers. And some people can’t design covers and can’t even LOOK at a cover someone else designed and tell if it’s right or not. Some people have no business or marketing head at all. Some people couldn’t lay out the interior of a book if their life depended on it. Some people have no technical skills period, and can barely surf the web. BUT, those people shouldn’t be held up as reasons why someone who CAN do those things shouldn’t. There is this pervasive: “Well most people can’t do this successfully, who the hell do you think you are?” And that kind of mentality is bad for progress. I believe a lot of people can do things they don’t think they can do but they won’t try. When they do try they give up at the first annoying obstacle or mini-failure. It’s pretty sad. Self-pubbing has opened a whole new world to me and I’m really proud of the stuff I’m creating. I hope to always get better and improve in all areas, but there is nothing like the sense of accomplishment I get when I release something *I MADE* out into the world. I find it frustrating that there are many people out there like me who would love self-publishing too, but they allow people to bully them because what those people think of them matters too much for them to buck the system. Writers don’t need to be overprotected and coddled, they need to make their mistakes and learn. And sorry for hogging your blog and talking so much. I tend to do that. You know, Zoe, it’s that bullying part that bugs me the most. It’s like some model that got frozen around the time of Dickens, with a similar kind of social oppression. A vestige of the hierarchical, authoritarian ways of being that we’ve been trying to throw off for a long time now. That big voice of authority, picking the winners and losers. I mean, do we really still need that? I completely agree. Couldn’t have said it better. But the truth is, they know a lot of it ISN’T trash and crap. And that’s the stuff they have to worry about. By continuing the myth though that it is trash and crap and amping up the stigma, it bullies unpublished writers into staying unpublished until they go through that funnel. It’s incredibly transparent (IMO) to anyone looking in from the outside. But of course they will scream and deny forever. Yes, we all learned how to use Google and the Amazon search bar at some point, didn’t we? I’m not sure where this “fear of the self-published” comes from. After all, there’s a lot of dreck to sift through from the traditional publishers, and there always has been. Thanks for your comment. True, Joel. And another point being missed in this strawman about wading through the crap is… most self-published books are not on physical bookstore shelves. They’re online. The books only in places like the Lulu store or whatever don’t get found cause no one but lulu authors goes to lulu to shop for books. But on say, Amazon, for example… It’s not like you log onto Amazon and are inundated with their whole catalog. There is a search feature and many ways to sift through books and come up with the best ones for what you want. There is also a reviews system and sampling once you do find a few good candidates. I think the REAL ire, is that self-pubbed books are on Amazon along WITH trad pubbed books. And sometimes those self-pubbed books get found better on Amazon than the trad pubbed books. Bookstore distribution is the only thing the trad published folks can hang onto and they can see the writing on the wall as we move more and more to digital distribution. So this strawman of “wading through the crap” has to be put up. But that’s like saying you have to wade through millions of crappy websites to find the ones you want. No you don’t, you just go into google and type a search phrase and the most applicable sites show up. Sure a bazillion of them might show up but… it doesn’t matter because you’re only going to look at the first page or so. It’s the same on Amazon and any other online shopping outlet. You are quite right to point out that there is more being published than anyone could hope to read. I don’t agree that publishers are necessarily the best ones to “pick the gems from the slush” because that’s just not an accurate depiction of publishers’ motives. And certainly it’s far better to publish a book well, that’s what my entire blog is about, and almost every article I write—to encourage potential self-publishers to create a product that can compete with those coming from the talented people working at traditional publishing houses. But I don’t denigrate the needs of authors. Unlike traditional publishing, which is almost solely concerned with how many copies can be sold from long experience I am much more in line with authors who may or may not care how many copies they sell. Sophie, we don’t need “gatekeepers” or “slush pile divers” to grant us the right to publish our own books. Why would we? If we take upon ourselves the responsiblity of publication, if we sell 10 copies or 50 copies or 5000 copies, so what? I get tremendous satisfaction from empowering people to take control of their own publishing destiny. And yes, I think they should get that book out of the desk drawer, dust if off, see if it needs a good edit, a workmanlike design, and get it in print. How does that harm you and the work you do in commercial publishing? It’s very likely that you will never even hear about these books, so I don’t think there’s any real problem having to spend any “time, money and effort” to find the things you want to read, you will find them just the way you do now. I guess I’m just more of an author’s advocate, a writer’s enabler. Of course there is more demand for publishing than publishing companies supply. If there wasn’t, then EVERYTHING that was submitted for publishing would get published. This demand for publishing, though, is the demand of AUTHORS. What about the demand of READERS? As a reader, I’ve never run out of things to read. There is so much to chose from…! If everything was published, imagine how much time, money and effort it would take to pick the gems from the slush? That’s what publishers do. Sure, there are many reasons to self-publish. I’m not against it. But it has to be done right way, from the right people. You say ‘why leave that manuscript sitting in a drawer – why not self-publish it?’ But I would argue that the real question is WHY self-publish it? If it isn’t any good, or if it isn’t presented well, or if no one knows about your book, or if no one is interested in your book, why would they buy it anyway? It might as well be sitting in a drawer if all these other factors aren’t addressed. Oh, and number 2. was using CS or LSI. I just forgot the organizational flow of my comment. der. 1. Educate yourself as much about publishing and specifically self-publishing as you can. And DON’T get your education from author services companies who want your money. There are plenty of legitimate guides out there to help you wade through the self publishing jungle. I would recommend anything by Tom and Marilyn Ross, as well as Print-on-demand book printing by Morris Rosenthal and The Indie Author Guide by April Hamilton. The main services you need are printing, cover design, interior design, and editing. It will be far better for you to figure out how to get these things taken care of separately than going with a “package” from one of these POD vanity presses. It’s just way too hard to make a profit selling through them because they are a middle man and eat too far into your profit. Also like Joel states, their distribution bragging is BS. When if comes to the printing part, if you want an actual physical book, I would highly recommend you use either CreateSpace (and avoid packages there if you can) or Lightning Source. you are absolutely correct. At times, because of the name on the cover, the book gets published by traditional pub houses. Indie authors tend to care more about their work because they know they are hit with the “first-impression” bug more. Knowing that you are responsible for not only writing the book, but for all the publicity it gets, also makes it a more personal project. In terms of the pub house that claims to get a book in front of 25 thousand bookstores. It’s called book distribution houses. I wouldn’t fall for this. Do you really think they contact 25 thousand bookstore owners when all they need to do is contact one distribution warehouse? While some POD places do help with promotion, I would suggest you don’t lean on that a lot. No one knows the book better than you. And as the author, you have the greatest at stake and will be the most mindful as how the product gets received by the public. Rita – It seems that many people have had luck with CreateSpace. Have you checked them out? ing at over 25,000 booksellers worldwide.notify you immediately.” I wonder if this is just hype. All these self publishing groups seem to want about $2000 upfront and 50%+ on all sales from the author for a reasonable effort. They have a low basic price but it doesn’t include important necessities. Hard to evaluate. Any comparisons out there? These choices are pretty difficult. You have to really understand what you want to accomplish with your book, and the kinds of help you’ll need to get there. Publishers do provide a lot of “services” in getting books to market, and when you become the publisher you take on the responsibility for all those chores. A lot of what you’re quoting (and I don’t know where it’s from) is hype. The “25,000 booksellers worldwide” likely simply represents the subscription to Ingram’s feed. This “publisher” is probably printing at Lightning Source, which puts all the books it prints into Ingram’s distribution, so anyone printing there could make a similar claim. If there are any specific companies you’re thinking of using, do check out reviews of these companies at Writer Beware and on Mick Rooney’s POD Self-Publishing and Independent Publishing blog, or search for them in the Absolute Write forums. Email me privately if you’d like to discuss this further. I do agree with Maria – I wish there was more written on how indie authors have the entire marketing journey on their shoulders. However, it should be noted that many traditional pub houses are also beginning to do this. They only spend money on their authors now if the books sell a certain amount in a couple of weeks or if the author is so huge they didn’t really need the marketing anyway. In terms of online bookstores not holding a huge market share, as an online bookstore owner, I would have to agree. While my store is relatively new, I only carry indie authors and authors that have used small pub houses. It is going extremely well. Getting your book in front of the public helps, no matter what venue you choose to do that with (brick/mortar or online). And while I do agree more brick and mortars should get off their high pedestals and carry indie authors, I don’t think web-based stores should be looked over. I’m not sure I agree with Maria. Consider that a vast majority—80 to 90% according to some estimates—of books from traditional publishers fail, and disappear quickly from the shelves. Compare that to a dedicated self-publisher who continues to promote her book all the way down the long tail, keeping the book in print and in front of likely buyers, slowly growing a readership. Which author is better off? Thanks for your comment, and for visiting, Melissa! Joel, I just hope I can have a few books out there by the time the tipping point truly gets here. I’d love to have 3-5 books in the Preternaturals Series out by that point. I want to have enough of a foothold that I can ride the wave. If ANYTHING publishers are currently doing is slowing down the ebook revolution I’m actually grateful. They will fail in their efforts, of course. But if they slow it down even a tiny bit, it’s to my benefit because I’ll have enough out there to more strongly ride the wave when it hits. Zoe, although it seems that things are moving very rapidly—and in an historic sense, they are—I think this transition is likely to take a while. Habits that are so well entrenched as something like reading don’t change all that fast. And there is a vast majority of the book reading public who have never seen an e-book reader and, I suspect, would be rather unwilling to pay today’s prices for one. But it’s coming, that’s for sure. Zoe, I think we’re watching the run-up to a tipping point driven by economics as well as convenience and ease of reproduction, and when we get there the world will look very different. I think your numbers may be a little off over how much market share online bookstores have. A Zogsby poll a couple of years ago indicated that 48% of book buyers bought at least SOME of their books online. Market share for online is much bigger than it once was. And even if it was only 20%, that’s still a lot of people, that’s a big enough market to tap and focus solely on. And of course ebooks are ONLY sold online. As the digital age makes ebooks a primary delivery method of content, brick-and-mortar bookstores may go the way of the Dodo altogether. Granted, brick and mortar distribution is still great if a big publisher gets behind you and distributes you that way, but there truly is no limit to the audience you can grow on the Internet. And publishing is changing. As we move forward things will be more online and less and less offline, especially factoring in ebooks. Online IMO is where you want to be well-positioned for sales in the future, a future I believe is only a few years away. When online distribution overtakes physical distribution, then those who have been online building Internet fan bases will be the ones best positioned to succeed in the new publishing climate. 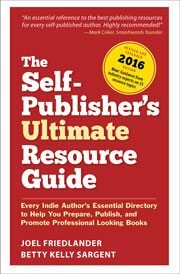 The biggest challenge facing self-publishers is distribution. Some 30 years ago, Publishers Group West (PGW) was founded and aggregated the combined power of independent publishers, setting up national distribution and presenting well over 100 indies as one sales entity. Soon independently published works, once derided as “small presses” became available in all bookselling venues. No such aggregator exists for self-published works. Usually the only sales venue available is online booksellers and this is only 20% of the market. How will consumers find out that these self-published works exist? They won’t see them in stores. Until the distribution problem is fixed, self-publishing will lack economy of scale and be a perilous undertaking. Print-on-demand solves the financial problem of holding inventory that doesn’t sell but it does nothing for the financial opportunity of having inventory that does sell. Zoe, great comment, thanks. One of the great things about indie publishing is that you take back control of the book itself from the middleman. What if you feel like putting some of your poetry in the back of the book as a gift to your readers? Hey, why not? Or order forms, coupons, ads for other titles? When it’s your book, you get to decide, instead of being dictated to. And I especially liked your point about backlist. When decisions are being made solely on the expectation of how many books will sell, and whether those figures clear some “profit hurdle” the real interests of authors and readers are often overlooked. Great to have you visiting, Zoe, thanks! Exactly. If an author is doing all that work, they need to be making more money. And it’s fairly futile for an author to do all that work if they can’t control all aspects of production and distribution and marketing. There are certain things a trad published author can’t do independently. Like good luck getting a publisher to offer a coupon in the back of your book where readers can go to your site and order personalized signed copies as gifts for friends. There are so many unique and creative ways an indie can market a book and get it out there, but when you don’t have full control of your product, you don’t have control of your marketing. I learned this lesson when I sold Mary Kay. You’re just a distributor, they set the rules. There are certain ways you cannot market or sell THEIR product. So it limits your business exponentially. Another benefit of POD and ebooks is that you can keep your entire backlist in print forever which allows you to gain some traction. Many midlist authors only have a few of their books “in print” at a time, so people who like one and go to buy others are only able to get them used, which doesn’t help the author. This list is extremely one-sided to the point of being absurd. Anyone who IS a published author — and I mean published by a REAL publishing house (not Lulu, for Pete’s sake) — can tell you that magic doesn’t happen as soon as your book is published. There aren’t people banging on your door for your consulting services or trying to get you to speak at their book signings and conferences. There’s not some incredible revenue stream that’ll have you buying new homes and cars. Very few people will ask for your autograph. It takes more than publishing a book to make any of that happen. I know. I’ve been there 70+ times over 20 years. I’ve had several best sellers and make a very good living as a writer. I did the book signings, conferences, and speaking gigs. I had someone squeal with delight when she recognized me on the show floor of a conference. Did it happen magically when my books were published? Of course not. It took work — by me and my publishers — to get the books out and line up the appearances. I know plenty of other authors who can tell you the same thing. Would this have happened if I self-published? Hell, no! You’re leading people to believe that fame and fortune can be theirs if they’ll sign up for Lulu and “publish” a book. What you don’t tell them is that publishing a book is the easy part. SELLING it is what’s tough. But I guess there isn’t any glamor in that. It’s better to hint at the magnificent rewards waiting to be reaped once your book is in print. I’ve seen self-publishers at town fairs, sitting alone in booths, waiting for someone to come buy a book they can sign. I had a friend who self-published 5 novels and was always on the verge of getting his screenplay produced. I once published a book for another author and got stuck with a basement full of the damn things when the wholesaler went out of business and returned 1200 copies. People need to think beyond your Seven Reasons. The only thing worse than not getting published is publishing a book that no one cares about. How many of your readers will do that? Maria, thanks for your comment. I guess my experience is different from yours. I’m a published author, and I published myself, but still found that all the hard work is in marketing and selling books, there’s no doubt of that. And certainly there’s no “magic” to the process, it’s a lot of hard work, often thankless. One of the first conversations I have with clients is about their expectations for their book. Perhaps just reading this one article I’ve given you an uncharacteristic view of where I’m coming from. I actually agree with almost everything in your comment, but I’m much more optimistic about the possibilities for self-publishers, and have experienced a lot of the benefits of publishing firsthand. In fact, I’ve found that it’s the quality of the book that counts the most when it comes to reader acceptance. Very few readers either know or care who the publisher of a book is. But they will not tolerate crappy books, nor should they. So my emphasis has become convincing authors to turn out a book that’s “professional” in every way possible. And, you know, Maria, the people who have followed that course have often done very well for themselves. Also, don’t overlook the powerful effect publishing has for people who may not be quite as good as you are. Lastly, although much of what you say makes sense, I believe your last statement is dead wrong. Getting a chance to put your work out in the public, to have your voice heard, even if it’s by only a small circle of people, is incredibly empowering and important for many authors. The authors care, and if that’s enough for them, why would you want to stifle their voice? 8. You know, deep down, you’re not a good writer. Jo, I suppose that’s true. However, it’s also true that many people who actually can’t write a lick have published pretty good books. I have clients like that, and with the right help, there doesn’t have to be a “No. 8.” But yes, there are probably a lot of books that have been self published out there were the authors could have used a little more reflection or outside input on what they were doing. Appreciate your comment, Jo, thanks. Joel – I hope that your readers see the subliminal lesson you created with this article. It is highly targeted, and constantly calls the reader’s attention back to his/her major problems. Let me point out specifics, and define the lessons for authors. 2. You give them a “This is about you statement” in no uncertain terms. How can I be so sure about that? Easy, you use those exact words! Writing for a targeted audience means that some people will read your work and say “This isn’t for me.” That is a good thing. It is a process of self-selection. If EVERYONE likes your writing, then NO ONE will pay you for it. Hey Bill, thanks for your thoughts. Yes, you’ve analyzed this post perfectly. I wasn’t exactly sure that readers would “get” where it was going, but you’ve given me faith! Thanks for your continued contribution. I believe that another reason a prospective author should not self-publish is when s/he has no business mind nor knowledge to speak of. I think this is often an over-looked aspect of the self-publishing route and yet quite possibly the only one that may sway the result of the exercise from pointless disaster to surprising success. People who have no idea of what putting a book together from a technical perspective entails should steer clear of self-publishing. I was pleased when my book (non-fiction, forthcoming) was taken on by a publisher because I realised that an awful lot of the groundwork would be done on my behalf. I would only need to check the proofs and be done with it. Now that I have had the opportunity to work in publishing for a while, I find the prospect of self-publishing intriguing and exciting, for the reasons Wideman himself pointed out. However, I worked as a management consultant and strategist for almost eight years; if I didn’t know what I know about business at large… well, I wouldn’t dream of going solo. Steph, you make a good point. Self-publishing really is a business, and not everyone (particularly writers) wants to be in business. From your background, you sound like a good candidate for self publishing. I know that part of my job is advising prospective self-publishers of the often large gap between their expectations and what is likely to happen. But that’s another aspect of business, isn’t it. You have to be adept and “switching hats” between creative artist and business person. Thanks for your comment, and for stopping by.